Ossabaw Island has meant many things to many people. For its earliest residents, Ossabaw was a bountiful place to live and gather yaupon holly. For relative latecomers it has been a source of live oak lumber, a series of brutal slave plantations, a winter retreat for northern industrialists, a cattle ranch, an artists’ retreat, and Georgia’s first Heritage Preserve. Despite the long history of a give-and-take relationship between humans and nature, Ossabaw now exudes a strong sense of untamed wildness that is part of its appeal to artists, scientists, and nature lovers alike. This book takes an interdisciplinary approach, combining photography and public history to delve into the island’s layered human and natural past and present. First and foremost, it is a photography book that exhibits a selection of Jill Stuckey’s work on the island, including the diverse ecological landscapes and the built human environment. Complementing Jill’s photographs are vignettes that share insights about the life and work of Roger Parker—Ossabaw’s “Saltwater Cowboy”—who worked on the island for more than half a century, and those close to him. 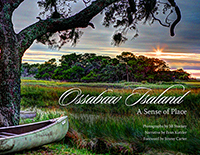 Likewise, short chapters accompany the photographs and discuss elements of Ossabaw’s environmental history as well as its historic and modern multisensory landscape. In this way, Jill’s photographs are the eyes of the book, the text, when appropriate, brings to life the sounds, smells, tastes, and touches that all contribute individually and collectively to the island’s power of place. It is this interdisciplinary approach that makes this book experimental and unique.